Alan Geddes was a latecomer to the art world. His early passions were mathematics and business. An outstanding student, he won a scholarship to Shore School in Sydney. In his final year he was dux of the school and then nearly topped the state in the NSW Leaving Certificate exams. During the war years he completed two degrees, served as an air force officer, married Nola and qualified as an actuary. After working with the MLC insurance company, he moved his young family to Singapore where he became general manager of Great Eastern Life Assurance. In that position he developed an interest in investing, learning when to buy and sell in the volatile rubber and tin share markets. He was a well-known supporter of Singapore charities, president of both the Singapore Rotary Club and the Singapore Red Cross. After 14 years Alan returned to Australia to join Mercantile Mutual Life Assurance as general manager and became involved in its funds management activities. He developed a reputation as a successful investor; one business magazine of the time describing him as an Australian ‘funds manager non pareil’. Looking for personal investment opportunities led him into the art world. His philosophy was that ’investment is an art, not a science’ and he believed that you had to guess what the majority are going to do. However, he did not guess he would enjoy the art scene as much as he did. After visiting galleries, he started to become interested in paintings for their own sakes and enjoyed making new social contacts. 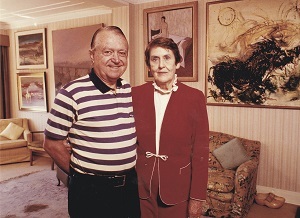 Alan and Nola liked to meet artists before purchasing their work and often entertained them at home. They met the art dealers Kim Bonython and Rudy Komon and were advised by them in many of their art choices. The collection was accumulated over the late 1970s and early 1980s and some works were loaned to the Art Gallery of New South Wales for international touring exhibitions. Alan and Nola also opened their home for private tours of their collection. Eventually they ran out of room at home and some works were hung in the boardrooms of companies where Alan was a director. Alan commented that he liked this as unlike other investments he could enjoy his art on a daily basis. Following his retirement Alan obtained an MA in English literature and was writing a doctoral thesis on the works of Thomas Keneally prior to his death in 1990. Nola enjoyed the collection until her own death earlier this year aged 99.